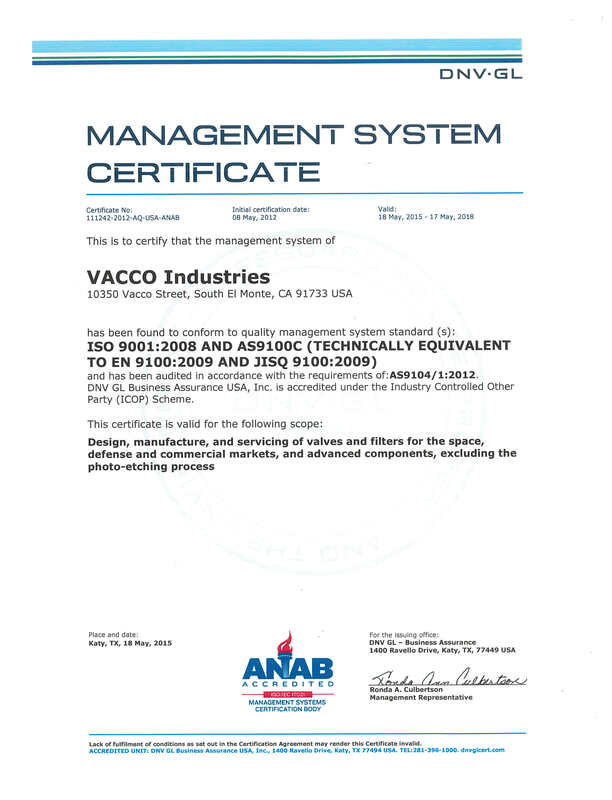 VACCO Industries is certified to the ISO 9001 and AS 9100 standards—including design. With this certification, VACCO continues to advance our systems to meet and exceed all mission-critical requirements that our aerospace and defense customers demand. 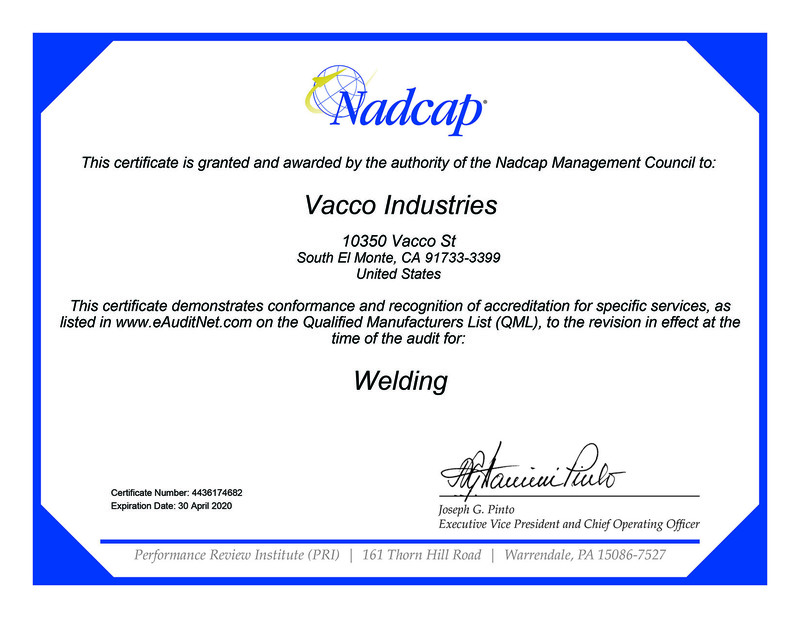 Certification to the latest standards further demonstrates VACCO’s commitment to Premier Customer Service, and upholds our position as a cutting-edge partner to the aerospace and defense industries. The revised standards have important new requirements that include risk mitigation and project management, while stressing the importance of organizational performance and ensuring the effectiveness of VACCO’s key processes. As an AS 9100 certified company, the products and services you require from VACCO are produced using the highest certified business management system in the aerospace and defense industries. 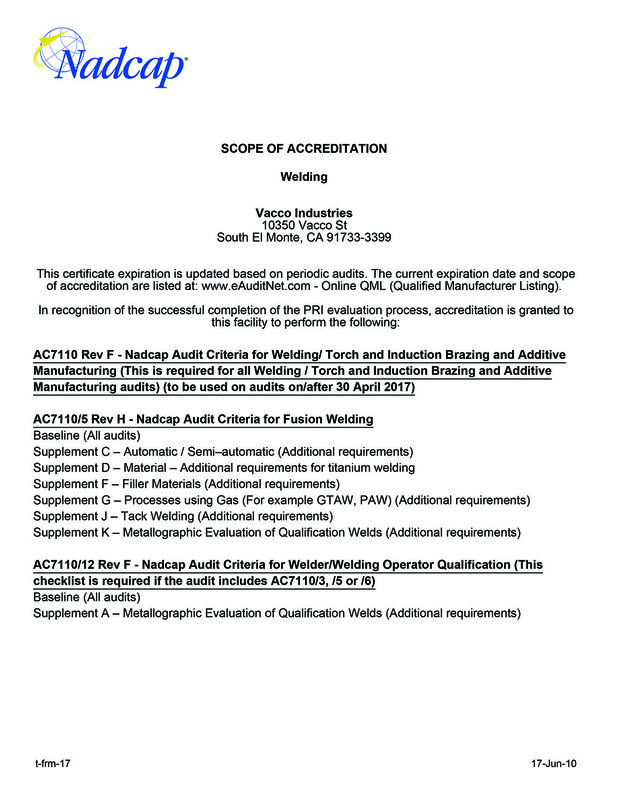 Performance Review Institute (PRI) / NADCAP has certified VACCO’s internal welding and liquid penetrant inspection processes. In addition, we have various Level 2 and Level 3 certified non-destructive testing (NDT) personnel in-house and on-contract for liquid penetrant and radiographic testing capabilities. VACCO always strives to meet and exceed our customers’ stringent requirements as the aerospace and defense industries continually evolve. Ingrained in the VACCO culture and at the forefront of all our decisions—quality is an integral component to the design and manufacture of the products and services we provide our customers.